I am based in Massachusetts and my onsite service range includes western and central Massachusetts, northern Connecticut, and eastern New York (Route 90 & Route 87 area). Other locations can be discussed. ​Please inquire via the Contact page or call or text me at (413) 310-4692 to discuss your horse and what I can do to help. I have been barefoot trimming starting with my own horses since 1999. The methods that I use are non-invasive and highly effective, with the healthy hooves of wild mustangs being the ideal model. ​We can't expect a horse to perform well and remain physically sound when it has hooves that are not functioning as nature intended. Horses should have feet that feel great, and so many are suffering in silence. Barefoot trimming has become a lot more technical than the old-fashioned "pasture trim", which trims the hoof flat, as if a shoe were to be nailed on, and pares out the natural callus of the sole and frog, and is usually done infrequently, allowing the hoof to become overgrown, stressed, and distorted. That is not the shape and quality of a natural hoof. We must also take into account the current state of the individual hoof and the internal hoof structures and trim accordingly. ​I use proven techniques from top researchers in barefoot hoof care for the rehabilitation of laminitis, navicular syndrome, contracted heels, under-run heels, thin soles, wall cracks, thrush, ​and other hoof pathologies. 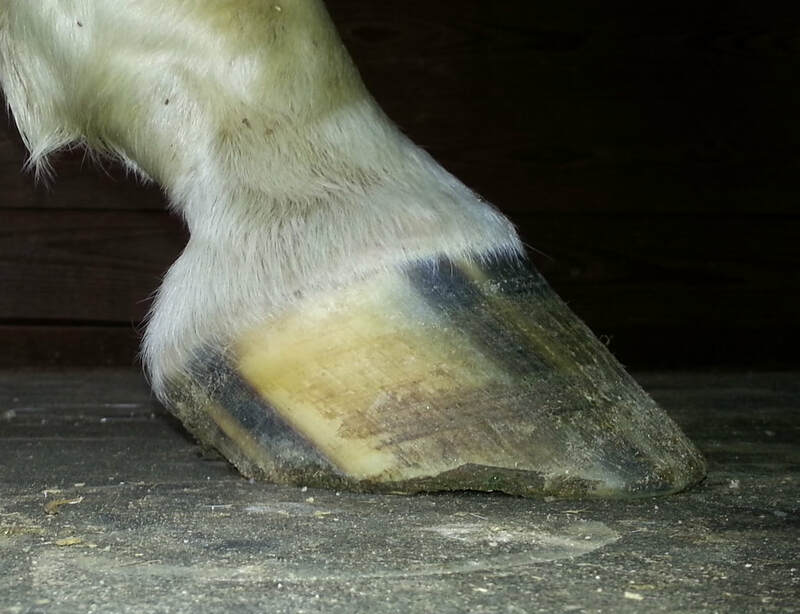 Benefits of these trimming practices on a healthy hoof include a correct hoof landing and prevention of possible ailments. I keep current on best practices with continuing education. 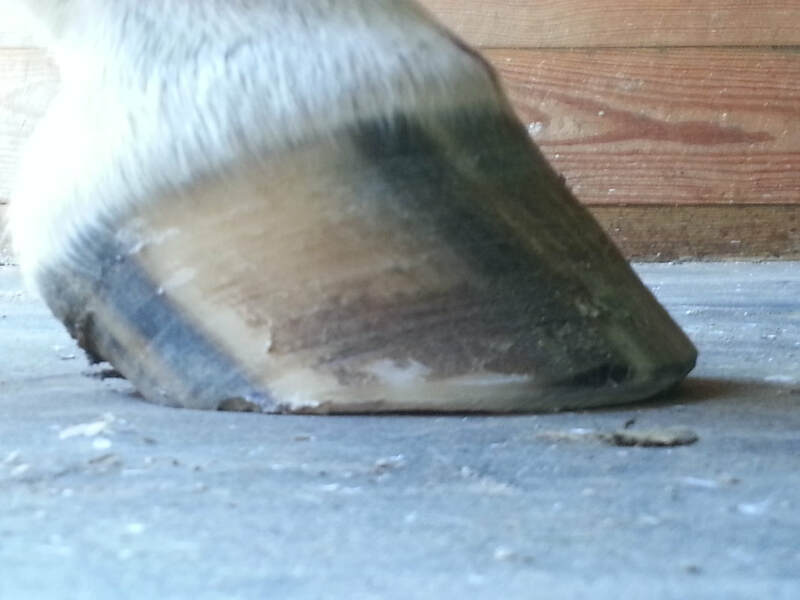 The hoof is a living structure and constantly strives to heal itself. Correct trimming puts it in the best position to do so. X-rays are encouraged for accurate diagnosis of pathologies, and I am happy to work with your veterinarian on a team approach. Combined with an ideal diet and movement, quality barefoot trimming has outstanding results in correcting and healing hoof pathologies and maintaining healthy hooves. When needed, hoof boots, hoof casts, and various padding materials including poured fills and silicon impression putty are applied for protection, comfort, and rehabilitation. Diet analysis is also offered, as nutrition is critical to hoof and whole body health. All recommendations are based on requirements set by the NRC (National Research Council) and Dr. Eleanor Kellon's guidelines. Horse&Rider: What are the key benefits of a shoeless foot? Peter Ramey: It's not about the foot alone; it's about improved overall health. Recent blood-flow studies by Robert Bowker, VMD, PhD, show that the horse's foot gets at least twice as much circulation when he's barefoot on yielding terrain, as compared to when he's wearing a metal shoe. The back part of the foot is designed by nature to flex, twist and distort with uneven terrain and turns--it helps reduce stress and prevent injury to joints, ligaments and tendons. Metal shoes prevent most of that twisting and flexion the hoof was designed for. For more information on the benefits of going barefoot, visit the Resources page. A healthy hoof will improve performance, and correct movement will improve hoof shape and function on barefoot horses. Classical training and barefoot hooves intertwine quite beautifully. For the history of my own journey in barefoot trimming, natural horsemanship, and classical dressage, visit the About Me page. ​"The best shoe for a horse is no shoe at all." from his classic book "The Lame Horse"
Kathleen Ladendecker is a leading West Springfield, Massachusetts farrier on NewHorse.com!